Of course, most of us know water molecules consist of two hydrogen atoms bound to one oxygen atom – hence the chemical formula H2O. We also know some of the properties of water, such as its ability to act as a solvent for many compounds, absorb and release heat, penetrate into small spaces in soil and rock, form ice that floats on surface water bodies, transport nutrients and waste in living organisms, and act as a major force capable of changing the earth’s surface. But how is this simple compound able to do such amazing things? The answer lies in the structure of the water molecule itself – a masterpiece of simplicity that sustains the complexity of our entire planet. The hydrogen and oxygen atoms join to produce a V-shaped molecule, with hydrogen atoms on one end and oxygen on the other. This configuration produces a highly polar molecule, having a positive charge on the hydrogen end and a negative on the oxygen end. Each end then attracts the oppositely charged ends of other water molecules and forms connections called hydrogen bonds. Due to its low molecular weight, water would normally be a gas at regular temperatures, but the molecules are bonded so tightly that the water is kept in a liquid state – a property that is obviously very important to all life. The polar nature of the water molecule makes it an excellent solvent for a wide variety of compounds. In fact, it is considered the universal solvent. When another substance is added to water, for example salt (sodium chloride, NaCl), the NaCl molecule dissociates allowing the positively charged sodium ion to attach to the negative end of the water molecule, and the negatively charged chlorine ion to attach to the positive end. This prevents the sodium chloride molecule from reforming, thus holding the salt in solution. This property enables water to act as a transport medium for the movement of nutrients and wastes to and within plant and animal tissues – another property essential to life. In fact, water is involved in most of the earth’s chemical reactions. Water also has the ability to dissolve molecules of oxygen, which makes it possible for aquatic life to exist. The strong bonds between water molecules also produce a strong film on the water surface (this is surface tension). This film allows water to hold up materials with larger weights and densities. 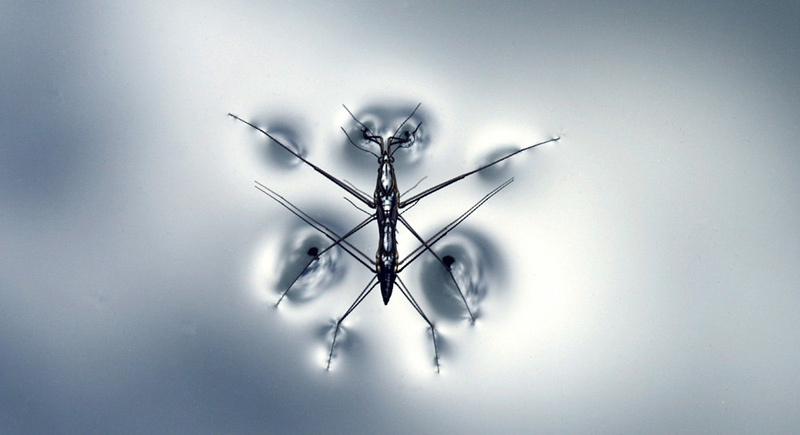 To many insects, surface tension is important to their life cycles and crucial for survival. Waves are created when the surface tension is utilized for the transfer of energy from wind to water. Waves are important for oxygen diffusion in surface water bodies. 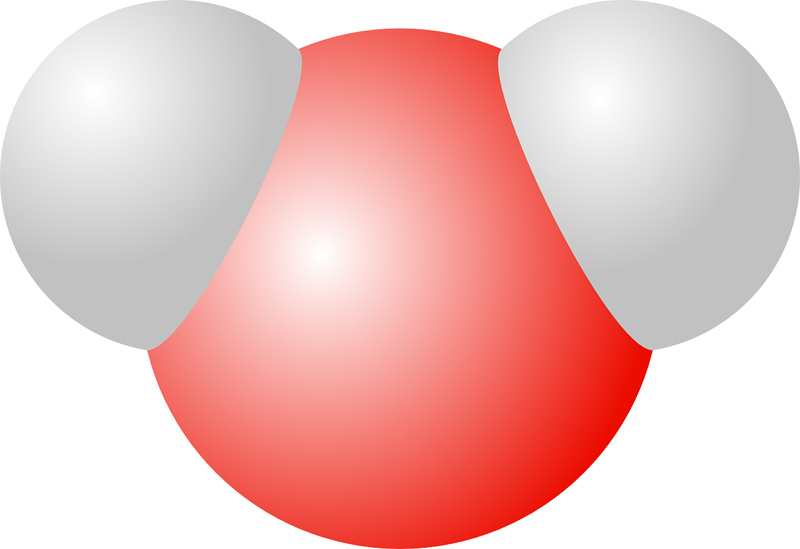 The V-shaped water molecule consists of one oxygen atom (red), and two hydrogen atoms (grey). This configuration makes the hydrogen end positively charged and the opposite end negative. Due to their polar nature, water molecules are attracted to molecules of other substances. This can be seen occurring in plant tissues, soils, glass, paper, and many other materials. The charged ends of the water molecules ‘reach out’ to the molecules of the other substance and adhere to them, at the same time pulling attached water molecules along for the ride (this is capillary action).In this way, water can actually travel up a glass tube, and be drawn into a paper towel or a sponge, thus allowing us to soak up spilled water. More importantly, this property allows water to move into small spaces such as between grains of soil and rock, and is responsible for the movement of water (and nutrients) through plants, making plant life possible. A very unique and important property of water occurs during the freezing process. In most substances, cooling brings molecules closer together resulting in an increase in density that reaches a maximum in its solid state. With a higher density, a solid will be heavier than its liquid state and will subsequently sink. But ice (solid water) floats on top of liquid water. How is this possible? Once again, one must look to the interaction of the water molecules for the answer. As water cools, it becomes denser until it reaches a temperature of 4 degrees Celsius – its point of highest density. As it continues to cool, molecules start to orient themselves into clusters, with each molecule joining through hydrogen bonding to four others in a tetrahedral arrangement. Since the molecules are progressively forming these complex structures, they are not as tightly packed together, and the density increases – the water expands. At zero degrees Celsius (freezing point), the ice crystals actually consists of rings of these tetrahedrons forming a highly ordered yet loosely structured complex of molecules. The molecules in the ice crystals are not as tightly packed as in the liquid water around them, which means they are lighter and subsequently float to the top – hence the formation of ice at the surface of water bodies. If water acted the same as other materials, ice would sink and lakes and rivers would freeze from the bottom up. Aquatic life could, therefore, not exist in cold climates. Northern water bodies would also probably never completely thaw. Hydrogen bonding between water molecules produces a strong film on the water surface that is crucial to aquatic life. Hydrogen bonds between water molecules are difficult to break, requiring a lot of energy. This gives water an unusually high boiling point, thereby allowing the absorption of a great deal of energy before the occurrence of a temperature change. This also applies to the melting of ice, since the melting process requires much energy. This property makes water a very good material for heat-transfer used in heating and cooling. The ability of water to absorb and store heat is also important for regulating the earth’s climate. Lakes and oceans act as temperature regulators that influence climate. Water can also transport large quantities of heat around the earth. Water vapor absorbs the sun’s ultraviolet radiation, which prevents harm to life on earth, and also blocks infrared radiation released from the earth from being lost into space, thereby keeping the earth warm. Water is a major force in reshaping the earth’s surface. Again, it is the interaction of the molecules that allows it to have such an effect. Water gets into rock cracks, freezes, expands, and then breaks the rock apart, causing erosion. 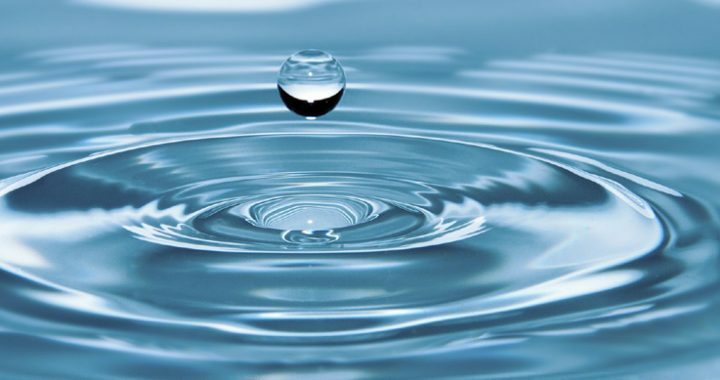 Due to the strong bonding between molecules, water has an unusually high viscosity, which slows runoff and allows more time for materials to be dissolved. The movement of glaciers has been and continues to be a major contributor to the reshaping of the earth’s surface. Once again, this is only possible because of the strong bonding between molecules. Layers of ice crystals are able to pass over each other without breaking the hydrogen bonds, thus keeping the crystals from breaking down. Life on earth cannot exist without water. It is without a doubt the most important and significant substance on the planet. Yet everything comes down to the amazing properties of this simple three-atom molecule. It truly is a molecular masterpiece. Posted in Environment and tagged aquatic, chemistry, water, water molecule, water properties.